News Update: Make your bookings now for the 24 Hours of Spa 2019. Call 01707 329988 to reserve all your travel, ticket and accommodation requirements. On top of that, the 71st running of 24 Hours of Spa will form part of the Blancpain Endurance Series, which guarantees a superb line up of the best drivers and finest GT machinery such as Aston Martin, Audi, BMW, Porsche and Mercedes. The suspense starts on Wednesday with the drivers parade in the centre of Spa. The atmosphere develops during the first practice on Thursday and reaches a crucial stage with qualification on Thursday night.The perfect start for an exciting weekend of endurance racing, with the 24 Hours race starting on Saturday afternoon. Hotel accommodation for the Spa 24 Hours 2019 is available in the pleasant town of Malmedy just a short distance from the Spa Francorchamps Circuit. 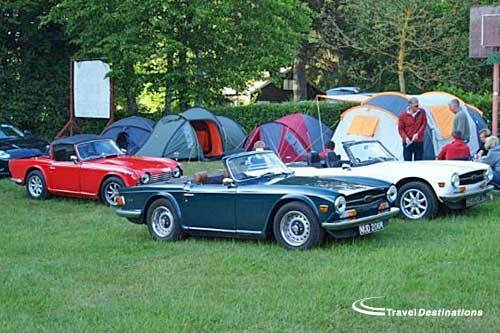 Alternatively we can offer superior camping facilities at the private Camping campground. Please click on the links or the tabs at the top of the page to find out more information. The Hotel Val D'Arimont is a family run hotel located less than 10 minutes drive of the circuit. Set in a quiet area the hotel offers a well stocked bar and excellent restaurant.